Our 2002 pipe is being produced by Ser Jacopo's master carver Giancarlo Guidi and is available only to NASPC members. It's a large sandblasted bent billard, similar to a Dunhill 120, but with Ser Jacopo's own individual and special creativity. Note: The NASPC Club pipe WILL NOT have a silver band. Delivery is expected sometime in late February to March 2002. The total number to be made will be the number pre-ordered. In past years, NASPC pipes have been in especially great demand after the limited edition was completed and sold. This pipe is no longer available for order from NASPC. 2002 Limited Edition NASPC Club Pipe. Available through the NASPC. See below for contact information. (Note: Club pipe WILL NOT have a silver band). 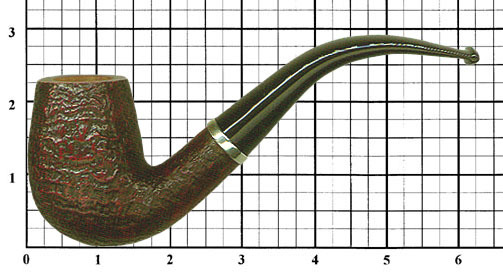 The order period for the NASPC 2002 pipe has passed. This pipe is no longer available for order.